Performance by Megan Reeve from the CD Selected Works by AMC Represented Artists, vol. 30. 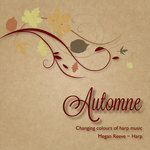 Automne : changing colours of harp music / Megan Reeve, harp. Storms : for solo harp / David Holyoake. Selected Works by AMC Represented Artists, vol. 30. Storms, a concert work in two contrasting movements, was inspired by an experience in North Africa - when I first heard Kora music - Kora is an ancient harp-like instrument, that can be just as dazzling as the western harp, a torrent of notes and a very exotic sound. On that trip I heard about ritual music of nomadic Berber tribes, particular music that is played to make it rain. I was very taken with that fantastical idea - that music could affect not only us but also the atmosphere in some way, so I came home and wrote Storms. The first movement is delicate and called 'Summoning Winds', with echoes of the music of North Africa, and using modal passages. The second is a more agressive movement, including percussing slapping of the soundboard. In that second movement I've tried to coax some of the darker moods, in part to demonstrate that the harp is capable of much more than just angelic glissandos. Contents note: I. Summoning winds -- II. Lightning. Kora music, contemporary harp music, Indian classical music, natural world. 27 Apr 14: Musique a Domicile, Mons, BELGIUM. Featuring Alice Petre. 19 May 13: Solo harp recital, Cowes Uniting Church, Cowes, Vic. Featuring Megan Reeve. 12 May 13: Solo harp recital: "Automne: changing colours of harp music is a journey through the fantastic kaleidoscope of compositions for the harp", Kinross Arts Centre, Vic. Featuring Megan Reeve. 13 Nov 2012: at Harp concert - Keziah Thomas (Fairfields Halls (London)). Featuring Keziah Thomas. 30 Sep 2012: at Harp Concert - Alice Petre (Eglise Saint-Denis). Featuring Alice Petre.